Two points define four different pentacles. 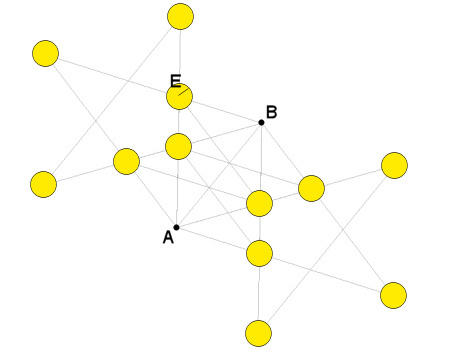 Given the coordinates of the first two points (A1,A2) and (B1,B2), with a simple mathematical formula it is possible to find the coordinates of the three other vertices in the pentacles. 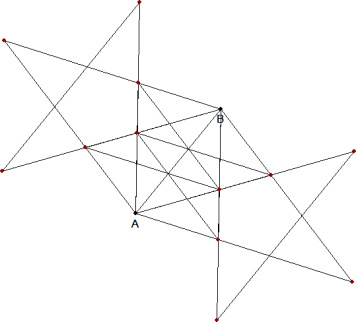 Any point at a distance from one of these 12 points smaller than a tolerance value E can be considered "on a pentacle" defined by the two points A and B. Has a result like the one mentioned any relevance? 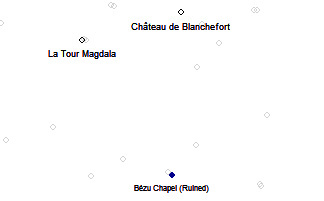 In order to prove it, you should compare the number of alignments found in a particular map with the mean number of alignments found in a large set of RGMs (randomly generated maps): "chi square" analysis will show if the map you are considering has any (sacred?!) "relevance". By now all the studies failed to show that there's any relevance in Rennes-le-Château area, but any analysis which pretends to affirm it has to follow the steps provided in this short guide.